Sumatra coffee is a beautiful deep blue-green color with the appearance of jade. There is a tendency to over roast Sumatrans (along with other dry processed wild coffees) as they do not show much roast color, and roast unevenly. Sometime the beans will look uneven and funky green. This is not a problem, however, or a sign of bad beans. 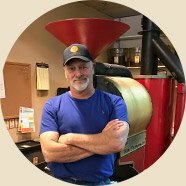 Quality in the cup is what matters, or should matter, not mere appearance of beans. The coffee is hand sorted, and come in single-picked, double- picked, and even triple-picked lots. Since Sumatran's are dry processed and often laid out to dry on the dirt in small villages, sorting the coffee is essential to take out the sticks and stones that the beans inevitably acquire, but triple picking does not necessarily improve the quality of cup. In fact, we sometimes find that over-picked beautiful polished coffees are sometimes bland in the cup. Language: Bahasa Indonesia (official, modified form of Malay), English, Dutch, local dialects, the most widely spoken of which is Javanese. 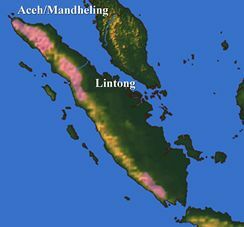 Growing Regions: Aceh around Laut Tawar Lake. Lake Toba region,Lintong Nihuta, Sumbul, Takengon. Introduced: Introduced by the Dutch in 17th Century.